Uranus is seen by Voyager 2. Credit: NASA/JPL/Voyager mission. Def. the number of molecules of a compound per a molecule of hydrogen is called the mixing ratio. An orange sunset in the Mahim Bay is shown around the Haji Ali Dargah in India. Credit: Humayunn Peerzaada. The Earth's shadow at sunrise is seen over a horizon where the sea meets the sky, looking west from Twin Peaks, San Francisco. Note: the lowest blue-grey area is not the sky but the surface of the Pacific Ocean. Credit: . Earth's shadow and Belt of Venus at sunset, looking east from the Marin Headlands just north of San Francisco. (Note: there is a thin greyish cloud layer partially obscuring the horizon in this image.) Credit: . Seeing an orange Sun due to atmospheric effects and feeling the warmth of its rays is probably a student's first encounter with an apparent astronomical orange radiation source. The Earth's shadow or Earth shadow (also sometimes known as the dark segment) are names for the shadow that the Earth itself casts on its atmosphere. This shadow is often visible from the surface of the Earth, as a dark band in the sky near the horizon. This atmospheric phenomenon can sometimes be seen twice a day, around the times of sunset and sunrise. 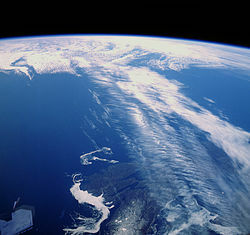 The effect of the Earth's shadow on the atmosphere is quite often visible in the sky, and yet often goes unrecognized. This shadow is visible to observers as it falls on the atmosphere of the Earth during the twilight hours. When the weather conditions and the observer's viewing point permit a clear sight of the horizon, the shadow can be seen as a dark blue or greyish-blue band. Assuming the sky is clear, the Earth's shadow is visible in the opposite half of the sky to the sunset or sunrise, and is seen right above the horizon as a dark blue band. In the image at right, the Earth's shadow at sunrise is seen over a horizon where the sea meets the sky, looking west from Twin Peaks, San Francisco. The lowest blue-grey area is not the sky but the surface of the Pacific Ocean. At left is the Earth's shadow at sunset, looking east from the Marin Headlands just north of San Francisco. There is a thin greyish cloud layer partially obscuring the horizon in this image. The Earth's shadow (as it is cast onto the atmosphere) can be observed during the twilight hours, assuming the sky is clear and the horizon is relatively unobstructed. At sunset the Earth's shadow is visible opposite the sunset in the eastern sky, just above the horizon. The shadow shows as a dark blue band that stretches over 180° of the horizon. It is most noticeable at the antisolar point, exactly opposite the sunset. At sunrise, the Earth's shadow is seen in a similar way, but in the western sky. The Earth's shadow is best observed when there is a low horizon (such as over the sea), and when the sky conditions are very clear. In addition, the higher up an observer is standing to view the horizon, the sharper the shadow appears. At sunrise, the Earth's shadow can be seen to set as the sun itself rises, and at sunset, the Earth's shadow rises as the sun sets. Atmospheric gases scatter blue light more than other wavelengths, giving the Earth a blue halo when seen from space. This is shown in the image at right. Def. performing astronomical observations to study the gases surrounding the Earth or any astronomical object is called atmospheric astronomy. "The light blue background is the dayglow emission (less than 1 kR) caused by the interaction between the photoelectrons generated by solar UV radiation and atmospheric molecules and atoms." This background occurs when imaging an Earth aurora from space using ultraviolet astronomy at the VUV wavelengths (135.6 ± 1.5 nm and 149.3 ± 1.5 nm). "Isophotes of [blue (395.0-485.0 nm)] background starlight brightness (integrated starlight, diffuse galactic light, cosmic light) have been constructed near the celestial [NCP and SCP], ecliptic [NEP and SEP], and galactic [NGP and SGP] poles from observations accumulated by the Pioneer 10 [and 11] imaging photopolarimeter from beyond the asteroid belt." "Diffuse galactic [blue] light refers to starlight scattered by interstellar grains. Integrated light from extragalactic sources is referred to as cosmic light." "Earth-based observers are limited in their perception of background starlight, due to the presence of airglow line and continuum emission, zodiacal light, and the effects of atmospheric extinction and scattering." Some of the blue background data were collected on September 30, 1973 (day/year 279/73). "To determine the brightnesses, isophotes were generated from six days of merged data, chosen to optimize sky coverage. The days used and their heliocentric distances in AU are: 354/72 (3.27), 149/73 (4.23), 237/73 (4.64), 279/73 (4.81), 21/74 (5.08), 68/74 (5.15)." Def. a "wind whose direction and speed are determined by a balance of the horizontal pressure gradient force and the force due to the earth's rotation to the left in the northern hemisphere and to the right in the southern hemisphere" is called a geostrophic wind. Def. a "warm dry wind blowing down the side of a mountain" is called a foehn, or foehn wind, or chinook. "The chinook generally blows from the southwest, but its direction may be modified by topography. When it sets in after a spell of intense cold, the temperature may rise by 20–40°F in 15 minutes due to replacement of a cold air mass with a much warmer air mass in minutes." Def. a "strong, abrupt rush of wind" is called a gust. Def. any "or all of the forms of water particles, whether liquid or solid, that fall from the atmosphere"" are called precipitation. Def. "precipitation products of the condensation of atmospheric water vapour" are called hydrometeors. This composition diagram shows the evolution/cycles of various elements in Earth's atmosphere. Credit: US Climate Change Science Program Office. "The biogenic volatile organic compounds (BVOC) include the quantitatively dominant group of the isoprenoids [isoprene, monoterpenes (e.g. α-pinene), sesquiterpenes] and oxygen-containing species (OVOC), such as alcohols, carbonyls and organic acids." This is a graph of the global mean atmospheric water vapor superimposed on an outline of the Earth. Credit: NASA. Def. the "gases surrounding the Earth or any astronomical body" are called an atmosphere. Being outside in the day light to look upward when the Sun is off to the East or West, you may see that the sky is blue depending on the weather. If the wind is blowing and the temperature is above freezing, you may be buffeted by an invisible force. The atmosphere of Earth, assuming that's the planet's solid surface you're bipedally standing on, is composed of small particles called molecules. While the wind may be physically assaulting you, it's actually these molecules, lots of them, that are contacting your skin. The main reason you're holding your shape is that your internal fluids and solids are pushing back. These molecules in many instances are in turn made up of atoms of chemical elements. At your geographical location, specified in [a geographic coordinate system] latitude and longitude, this gaseous envelope extends upward. The atmosphere of Earth changes with altitude. At high enough altitude the composition changes significantly, as does the temperature and pressure. If you've packed the appropriate instruments on board for the trip upward, you may have noticed something else has changed. The clouds of Venus are capable of producing lightning much like the clouds on Earth. The existence of lightning had been controversial since the first suspected bursts were detected by the Soviet Venera probes. In 2006–07 Venus Express clearly detected whistler mode waves, the signatures of lightning. Their intermittent appearance indicates a pattern associated with weather activity. The lightning rate is at least half of that on Earth. In 2007 the Venus Express probe discovered that a huge double atmospheric vortex exists at the south pole of the planet. This is a map of global long term monthly average surface air temperatures in Mollweide projection. Credit: PZmaps. A spectrum is taken of blue sky clearly showing solar Fraunhofer lines and atmospheric water absorption band. Credit: . The Earth has a blue halo when seen from space. Credit: . The map at right shows the global long term monthly average surface air temperature for Earth. The zones of Earth's climates, going from the equator upward (and downward) are Tropical, Dry, Moderate, Continental and Polar. There are subzones within these zones. Def. "any of the high-speed, high-altitude air currents that circle the Earth in a westerly direction" is called a jet stream. Def. a "large white puffy cloud" is called a cumulus cloud. a group or swarm" is called a cloud. Def. device "that moves so as to aim a collector of solar energy at the sun as it crosses the sky" is called a solar tracker. Diffuse sky radiation is solar radiation reaching the Earth's surface after having been scattered from the direct solar beam by molecules or suspensoids in the atmosphere. It is also called skylight, diffuse skylight, or sky radiation and is the reason for changes in the colour of the sky. Of the total light removed from the direct solar beam by scattering in the atmosphere (approximately 25% of the incident radiation when the sun is high in the sky, depending on the amount of dust and haze in the atmosphere), about two-thirds ultimately reaches the earth as diffuse sky radiation. "[P]referential absorption of sunlight by ozone over long horizon paths gives the zenith sky its blueness when the sun is near the horizon". This is a color image made from the first post-sunset sequence of calibrated color images, with the color balance set to approximate what the sunset color would have looked like to the human eye. Credit: NASA/JPL/Texas A&M/Cornell. "A color image was made [at lower right] from the first post-sunset sequence of calibrated color images, with the color balance set to approximate what the sunset color would have looked like to the human eye. The color seen in this first post-sunset image was then used to colorize each image in the sequence. Approximately one-minute gaps between consecutive color images meant the Sun's position changed within each color set, so the images had to be manually shifted to compensate for this motion. In this fashion, the position and brightness of the Sun are taken from each individual image, but the color is taken from a single set of images. The images were then combined into a movie where one color set fades gracefully into the next. Analysis of the five color sets shows that there were only small color variations during the sunset, so most of the real variations are captured in the movie." "The rapid dimming of the Sun near the horizon is due to the dust in the sky. There is nearly twice as much dust as there was when the Mars Pathfinder spacecraft, which landed on Mars in 1997, imaged the sunset. This causes the Sun to be many times fainter. The sky above the Sun has the same blue tint observed by Pathfinder and also by Viking, which landed on Mars in 1976. This is because dust in the martian atmosphere scatters blue light forward toward the observer much more efficiently than it scatters red light forward. Therefore, a "halo" of blueish sky color is always observed close to the Sun. We're only seeing half of this halo in the movie, because the other half is below the horizon." Callisto is surrounded by an extremely thin atmosphere composed of carbon dioxide and probably molecular oxygen, as well as by a rather intense ionosphere. Oxygen has not yet been directly detected in the atmosphere of Callisto. Observations with the Hubble Space Telescope (HST) placed an upper limit on its possible concentration in the atmosphere, based on lack of detection, which is still compatible with the ionospheric measurements. At the same time HST was able to detect condensed oxygen trapped on the surface of Callisto. Callisto's ionosphere was first detected during Galileo flybys; its high electron density of 7–17 x 104 cm−3 cannot be explained by the photoionization of the atmospheric carbon dioxide alone. Hence, it is suspected that the atmosphere of Callisto is actually dominated by molecular oxygen (in amounts 10–100 times greater than CO2). Europa has a tenuous atmosphere composed primarily of oxygen. The molecular hydrogen that escapes Europa's gravity, along with atomic and molecular oxygen, forms a torus (ring) of gas in the vicinity of Europa's orbit around Jupiter. This "neutral cloud" has been detected by both the Cassini and Galileo spacecraft, and has a greater content (number of atoms and molecules) than the neutral cloud surrounding Jupiter's inner moon Io. Models predict that almost every atom or molecule in Europa's torus is eventually ionized, thus providing a source to Jupiter's magnetospheric plasma. NASA's Hubble Space Telescope found ozone's spectral "fingerprint" during observations of Ganymede made by Keith Noll and colleagues at the Space Telescope Science Institute in Baltimore, Maryland. Credit: NASA. "Though ozone may be diminishing on Earth, it is being manufactured one-half billion miles away, on Jupiter's largest satellite, Ganymede." "NASA's Hubble Space Telescope found ozone's spectral "fingerprint" during observations of Ganymede made by Keith Noll and colleagues at the Space Telescope Science Institute in Baltimore, Maryland. These Hubble Faint Object Spectrograph results were presented at the American Astronomical Society's 27th Annual Meeting of the Division of Planetary Sciences in Kona, Hawaii." During an eclipse of Jupiter's moon Io on January 1, 2001, NASA's Cassini spacecraft recorded glows from auroras and volcanoes on Io. Credit: NASA/JPL/University of Arizona. "The camera on Cassini captured images of eclipsed Io in several colors ranging from the near-ultraviolet to the near-infrared. A black-and-white movie clip of 48 clear-filter frames spanning two hours during the eclipse was released on February 5 (PIA02882). Here, two colors have been added to show the type of evidence used by imaging scientists in determining the source of Io's auroral glows. The color pictures were taken at lower resolution -- 120 kilometers (75 miles) per pixel rather than 60 kilometers(37 miles) per pixel -- and less frequently than the clear-filter images. White dots near the equator are volcanoes, some of which are much brighter than the faint atmospheric glows. The brightest of them is the volcano Pele." "Emissions of light (at wavelengths of 595 to 645 nanometers) likely arise from a tenuous atmosphere of oxygen. These glows would appear red to the eye and are consequently colored red in the movie. Emissions in near-ultraviolet wavelengths (between 300 and 380 nanometers), corresponding wavelength to the bright blue visible glows one would expect from sulfur dioxide. They have been colored blue in the movie. The blue glows are restricted to areas deep down in the atmosphere near the surface of Io, while the red glows are much more extensive, reaching heights of up to 900 kilometers (560 miles). This would be expected if the blue glows are indeed produced by sulfur dioxide, since sulfur dioxide molecules are heavier than oxygen atoms, so are more closely bound to the surface by gravity. The prominent blue and red regions near the equator of Io dance across the moon with the changing orientation of Jupiter's magnetic field, illustrating the relationship between Io's auroras and the electric currents that excite them." This is a Cassini image in natural color of the gaseous object Saturn. Credit: NASA/JPL/Space Science Institute. The image shows Saturn's northern hemisphere from the Cassini spacecraft with Mimas in front. Credit: NASA/JPL/Space Science Institute. The planet exhibits a pale yellow hue due to ammonia crystals in its upper atmosphere. Its exterior is predominantly composed of gas and it lacks a definite surface. The planet primarily consists of hydrogen. The outer atmosphere of Saturn contains 96.3% molecular hydrogen and 3.25% helium. The proportion of helium is significantly deficient compared to the abundance of this element in the Sun. Trace amounts of ammonia, acetylene, ethane, propane, phosphine and methane have been detected in Saturn's atmosphere. "Saturn's northern hemisphere is presently relatively cloud-free, and rays of sunlight take a long path through the atmosphere. This results in sunlight being scattered at shorter (bluer) wavelengths, thus giving the northernmost latitudes their bluish appearance at visible wavelengths." This natural color image shows Titan's upper atmosphere. Credit: NASA/JPL/Space Science Institute. Titan has a vortex at its south pole. Credit: Cassini Imaging Team, ISS, JPL, ESA, NASA. "This natural color image [at right] shows Titan's upper atmosphere -- an active place where methane molecules are being broken apart by solar ultraviolet light and the byproducts combine to form compounds like ethane and acetylene. The haze preferentially scatters blue and ultraviolet wavelengths of light, making its complex layered structure more easily visible at the shorter wavelengths used in this image." "Lower down in the atmosphere, the haze turns into a globe-enshrouding smog of complex organic molecules. This thick, orange-colored haze absorbs visible sunlight, allowing only perhaps 10 percent of the light to reach the surface. The thick haze is also inefficient at holding in and then re-radiating infrared (thermal) energy back down to the surface. Thus, despite the fact that Titan has a thicker atmosphere than Earth, the thick global haze causes the greenhouse effect there to be somewhat weaker than it is on Earth." "Images taken with the Cassini spacecraft wide-angle camera using red, green and blue spectral filters were combined to create this natural color view. The images were obtained at a distance of approximately 9,500 kilometers (5,900 miles) from Titan on March 31, 2005. The image scale is approximately 400 meters (1,300 feet) per pixel." The second image at right is of the south pole. "What's happening over the south pole of Titan? A vortex of haze appears to be forming, although no one is sure why. The [second at right] natural-color image shows the light-colored feature. The vortex was found on images taken last month when the robotic Cassini spacecraft flew by the unusual atmosphere-shrouded moon of Saturn. Cassini was only able to see the southern vortex because its orbit around Saturn was recently boosted out of the plane where the rings and moons move. Clues as to what created the enigmatic feature are accumulating, including that Titan's air appears to be sinking in the center and rising around the edges. Winter, however, is slowly descending on the south of Titan, so that the vortex, if it survives, will be plunged into darkness over the next few years." Uranus's atmosphere [has a] primary composition of hydrogen and helium [and] contains more "ices" such as water, ammonia, and methane, along with traces of hydrocarbons. The helium molar fraction, i.e. the number of helium atoms per molecule of gas, is 0.15 ± 0.03 in the upper troposphere, which corresponds to a mass fraction 0.26 ± 0.05. The third most abundant constituent of the Uranian atmosphere is methane (CH4). Methane molecules account for 2.3% of the atmosphere by molar fraction below the methane cloud deck at the pressure level of 1.3 bar (130 kPa); this represents about 20 to 30 times the carbon abundance found in the Sun. The mixing ratio is much lower in the upper atmosphere owing to its extremely low temperature, which lowers the saturation level and causes excess methane to freeze out. The abundances of less volatile compounds such as ammonia, water and hydrogen sulfide in the deep atmosphere are poorly known. ... Along with methane, trace amounts of various hydrocarbons are found in the stratosphere of Uranus, which are thought to be produced from methane by photolysis induced by the solar ultraviolet (UV) radiation. They include ethane (C2H6), acetylene (C2H2), methylacetylene (CH3C2H), and diacetylene (C2HC2H). Spectroscopy has also uncovered traces of water vapor, carbon monoxide and carbon dioxide in the upper atmosphere, which can only originate from an external source such as infalling dust and comets. In 1986 Voyager 2 found that the visible southern hemisphere of Uranus can be subdivided into two regions: a bright polar cap and dark equatorial bands (see figure on the right). Their boundary is located at about -45 degrees of latitude. A narrow band straddling the latitudinal range from -45 to -50 degrees is the brightest large feature on the visible surface of the planet. It is called a southern "collar". The cap and collar are thought to be a dense region of methane clouds located within the pressure range of 1.3 to 2 bar (see above). Besides the large-scale banded structure, Voyager 2 observed ten small bright clouds, most lying several degrees to the north from the collar. In all other respects Uranus looked like a dynamically dead planet in 1986. Unfortunately Voyager 2 arrived during the height of the planet's southern summer and could not observe the northern hemisphere. At the beginning of the 21st century, when the northern polar region came into view, the Hubble Space Telescope (HST) and Keck telescope initially observed neither a collar nor a polar cap in the northern hemisphere. So Uranus appeared to be asymmetric: bright near the south pole and uniformly dark in the region north of the southern collar. In 2007, when Uranus passed its equinox, the southern collar almost disappeared, while a faint northern collar emerged near 45 degrees of latitude. There are some reasons to believe that physical seasonal changes are happening in Uranus. While the planet is known to have a bright south polar region, the north pole is fairly dim, which is incompatible with the model of the seasonal change outlined above. During its previous northern solstice in 1944, Uranus displayed elevated levels of brightness, which suggests that the north pole was not always so dim. This information implies that the visible pole brightens some time before the solstice and darkens after the equinox. Detailed analysis of the visible and microwave data revealed that the periodical changes of brightness are not completely symmetrical around the solstices, which also indicates a change in the meridional albedo patterns. Finally in the 1990s, as Uranus moved away from its solstice, Hubble and ground based telescopes revealed that the south polar cap darkened noticeably (except the southern collar, which remained bright), while the northern hemisphere demonstrated increasing activity, such as cloud formations and stronger winds, bolstering expectations that it should brighten soon. This indeed happened in 2007 when the planet passed an equinox: a faint northern polar collar arose, while the southern collar became nearly invisible, although the zonal wind profile remained slightly asymmetric, with northern winds being somewhat slower than southern. The troposphere is the lowest and densest part of the atmosphere and is characterized by a decrease in temperature with altitude. The temperature falls from about 320 K at the base of the nominal troposphere at −300 km to 53 K at 50 km. The temperatures in the coldest upper region of the troposphere (the tropopause) actually vary in the range between 49 and 57 K depending on planetary latitude. The tropopause region is responsible for the vast majority of the planet’s thermal far infrared emissions, thus determining its effective temperature of 59.1 ± 0.3 K.
The middle layer of the Uranian atmosphere is the stratosphere, where temperature generally increases with altitude from 53 K in the tropopause to between 800 and 850 K at the base of the thermosphere. The heating of the stratosphere is caused by absorption of solar UV and IR radiation by methane and other hydrocarbons, which form in this part of the atmosphere as a result of methane photolysis. Heat is also conducted from the hot thermosphere. The hydrocarbons occupy a relatively narrow layer at altitudes of between 100 and 300 km corresponding to a pressure range of 10 to 0.1 mbar (1000 to 10 kPa) and temperatures of between 75 and 170 K. The most abundant hydrocarbons are methane, acetylene and ethane with mixing ratios of around 10−7 relative to hydrogen. The mixing ratio of carbon monoxide is similar at these altitudes. Heavier hydrocarbons and carbon dioxide have mixing ratios three orders of magnitude lower. The abundance ratio of water is around 7×10−9. Ethane and acetylene tend to condense in the colder lower part of stratosphere and tropopause (below 10 mBar level) forming haze layers, which may be partly responsible for the bland appearance of Uranus. The concentration of hydrocarbons in the Uranian stratosphere above the haze is significantly lower than in the stratospheres of the other giant planets. The outermost layer of the Uranian atmosphere is the thermosphere and corona, which has a uniform temperature around 800 to 850 K. The heat sources necessary to sustain such a high value are not understood, since neither solar far UV and extreme UV radiation nor auroral activity can provide the necessary energy. The weak cooling efficiency due to the lack of hydrocarbons in the stratosphere above 0.1 mBar pressure level may contribute too. In addition to molecular hydrogen, the thermosphere-corona contains many free hydrogen atoms. Their small mass together with the high temperatures explain why the corona extends as far as 50 000 km or two Uranian radii from the planet. This extended corona is a unique feature of Uranus. Its effects include a drag on small particles orbiting Uranus, causing a general depletion of dust in the Uranian rings. The Uranian thermosphere, together with the upper part of the stratosphere, corresponds to the ionosphere of Uranus. Observations show that the ionosphere occupies altitudes from 2 000 to 10 000 km. The Uranian ionosphere is denser than that of either Saturn or Neptune, which may arise from the low concentration of hydrocarbons in the stratosphere. The ionosphere is mainly sustained by solar UV radiation and its density depends on the solar activity. Auroral activity is insignificant as compared to Jupiter and Saturn. It is the coldest planetary atmosphere in the Solar System, with a minimum temperature of 49 K (−224 °C). The lowest temperature recorded in Uranus's tropopause is 49 K (−224 °C), making Uranus the coldest planet in the Solar System. Neptune's atmosphere is composed primarily of hydrogen and helium, along with traces of hydrocarbons and possibly nitrogen, contains a higher proportion of "ices" such as water, ammonia, and methane. Traces of methane in the outermost regions in part account for the planet's blue appearance. At high altitudes, Neptune's atmosphere is 80% hydrogen and 19% helium. A trace amount of methane is also present. Prominent absorption bands of methane occur at wavelengths above 600 nm, in the red and infrared portion of the spectrum. As with Uranus, this absorption of red light by the atmospheric methane is part of what gives Neptune its blue hue, although Neptune's vivid azure differs from Uranus's milder cyan. Since Neptune's atmospheric methane content is similar to that of Uranus, some unknown atmospheric constituent is thought to contribute to Neptune's colour. Neptune's thermosphere is at an anomalously high temperature of about 750 K.
In 2007 it was discovered that the upper troposphere of Neptune's south pole was about 10 °C warmer than the rest of Neptune, which averages approximately -200 °C (70 K). The warmth differential is enough to let methane, which elsewhere lies frozen in Neptune's upper atmosphere, leak out as gas through the south pole and into space. The relative "hot spot" is due to Neptune's axial tilt, which has exposed the south pole to the Sun for the last quarter of Neptune's year, or roughly 40 Earth years. As Neptune slowly moves towards the opposite side of the Sun, the south pole will be darkened and the north pole illuminated, causing the methane release to shift to the north pole. "In all the stars analysed ... it is very unlikely that the lithium observed in the atmosphere was produced, even in part, inside the stars themselves, and then transported up into the atmospheres." "It is the speed of the dominant group that remains because of the self-canceling rapid oscillations away from the point of stationary phase." Def. a "measure of cold or heat ... [a] property of macroscopic amounts of matter that serves to gauge the average intensity of the random actual motions of the individually mobile particulate constituents" is called temperature. Def. "the branch of meteorology involving the observation of the atmosphere by means of balloons, airplanes, etc" is called aerology. The composite shows upper atmospheric lightning and electrical discharge phenomena. Credit: Abestrobi. Def. "the atmosphere of the Earth and the other planets with reference to their chemical composition, physical properties, relative motion, and responses to radiation from space" is called aeronomy. Aeronomy is the study of the upper layers of the atmosphere, where dissociation and ionization are important. Aeronomy is the science of the upper region of the atmosphere, where dissociation and ionization are important. Climatology is represented by this global warming map. Credit: Robert A. Rohde. Climatology "is the study of climate, scientifically defined as weather conditions averaged over a period of time, and is a branch of the atmospheric sciences. Climate encompasses the statistics of temperature, humidity, atmospheric pressure, wind, rainfall, atmospheric particle count and numerous other meteorological elements in a given region over long periods of time. Def. a "layer of the Earth's atmosphere that is directly above the stratosphere and directly below the thermosphere" is called a mesosphere. Def. in "the atmosphere, the boundary between the mesosphere and the ionosphere, [...] where the temperature reaches its minimum value" is called a mesopause. Def. a "layer of the Earth's atmosphere directly above the mesosphere and directly below the exosphere" is called a thermosphere. Def. the "part of the Earth's atmosphere beginning at an altitude of about 50 kilometers [31 miles] and extending outward 500 kilometers [310 miles] or more" or the "similar region of the atmosphere of another planet" is called an ionosphere. "As a spacecraft travels through the solar system, a targeted radio signal sent back to Earth can be aimed through the ionosphere of a nearby planet. Plasma in the ionosphere causes small but detectable changes in the signal that allow scientists to learn about the upper atmosphere." Def. "the uppermost layer of a planet's atmosphere" or "an extremely thin atmosphere"" is called an exosphere. Into the exosphere or outer space, temperature rises from around 1,500°C (centigrade) to upwards of 100,000 K (kelvin). Def. "the study of the atmosphere and its phenomena, especially with weather and weather forecasting" is called meteorology. Def. the "study of the theoretical effects of astronomical bodies and forces on the Earth’s atmosphere" and on the atmosphere of other astronomical objects is called astrometeorology. Def. a "system of winds rotating around a center of low atmospheric pressure ... [t]he more or less violent small-scale circulations such as tornadoes, waterspouts, and dust devils" is called a cyclone. The image provides a view of Atlantis's payload bay for the Atmospheric Laboratory for Applications and Science (ATLAS-1). Credit: NASA. The Atmospheric Laboratory for Applications and Science (ATLAS-1) [(April 2, 1992) is] on Spacelab pallets mounted in orbiter's cargo bay. The non-deployable payload, equipped with 12 instruments from the United States, France, Germany, Belgium, Switzerland, The Netherlands and Japan, conducted studies in atmospheric chemistry, solar radiation, space plasma physics and ultraviolet astronomy. ATLAS-1 instruments were: Atmospheric Trace Molecule Spectroscopy (ATMOS); Grille Spectrometer; Millimeter Wave Atmospheric Sounder (MAS); Imaging Spectrometric Observatory (ISO); Atmospheric Lyman-Alpha Emissions (ALAE); Atmospheric Emissions Photometric Imager (AEPI); Space Experiments with Particle Accelerators (SEPAC); Active Cavity Radiometer (ACR); Measurement of Solar Constant (SOLCON); Solar Spectrum (SOLSPEC); Solar Ultraviolet Spectral Irradiance Monitor (SUSIM); and Far Ultraviolet Space Telescope (FAUST). Other payloads [aboard] included [the] Shuttle Solar Backscatter Ultraviolet (SSBUV) experiment. The atmosphere of Venus is that of a volcanic planet. ↑ 1.0 1.1 1.2 Les Cowley. Earth's shadow. www.atoptics.co.uk. ↑ 2.0 2.1 What causes layers in the sunrise and sunset?. earthsky.org. ↑ Paula G. Coble. "Marine Optical Biogeochemistry: The Chemistry of Ocean Color". Chemical Reviews 2007 107: 402–18. doi:10.1021/cr050350. ↑ C.-I. MengR. E. Huffman (April 1984). "Ultraviolet imaging from space of the aurora under full sunlight". Geophysical Research Letters 11 (4): 315-8. doi:10.1029/GL011i004p00315. http://onlinelibrary.wiley.com/doi/10.1029/GL011i004p00315/full. Retrieved 2013-05-31. ↑ 5.0 5.1 5.2 5.3 5.4 5.5 5.6 5.7 G. Toller, H. Tanabe, and J. L. Weinberg (December 1987). "Background starlight at the north and south celestial, ecliptic, and galactic poles". Astronomy and Astrophysics 188 (1): 24-34. http://articles.adsabs.harvard.edu/cgi-bin/nph-iarticle_query?bibcode=1987A%26A...188...24T&db_key=AST&page_ind=0&data_type=GIF&type=SCREEN_VIEW&classic=YES. Retrieved 2013-05-31. ↑ geostrophic wind. San Francisco, California: Wikimedia Foundation, Inc. July 11, 2011. Retrieved 2013-02-17. ↑ foehn. San Francisco, California: Wikimedia Foundation, Inc. January 19, 2013. Retrieved 2013-02-17. ↑ chinook. San Francisco, California: Wikimedia Foundation, Inc. October 17, 2012. Retrieved 2013-02-17. ↑ gust. San Francisco, California: Wikimedia Foundation, Inc. January 14, 2013. Retrieved 2013-02-17. ↑ precipitation. San Francisco, California: Wikimedia Foundation, Inc. February 10, 2013. Retrieved 2013-02-15. ↑ hydrometeor. San Francisco, California: Wikimedia Foundation, Inc. July 7, 2012. Retrieved 2013-02-15. ↑ 212.159.113.112 (6 May 2003). atmosphere. San Francisco, California: Wikimedia Foundation, Inc. Retrieved 2016-02-06. ↑ 20.0 20.1 S. T. Russell, T. L. Zhang, M. Delva, W. Magnes, R. J. Strangeway, H. Y. Wei (2007). "Lightning on Venus inferred from whistler-mode waves in the ionosphere". Nature 450 (7170): 661–662. doi:10.1038/nature05930. PMID 18046401. ↑ Staff (28 November 2007). 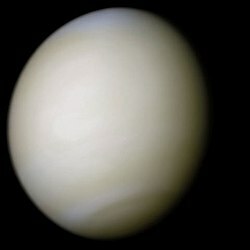 "Venus offers Earth climate clues". BBC News. Retrieved 2007-11-29. ↑ jet stream. San Francisco, California: Wikimedia Foundation, Inc. November 10, 2012. Retrieved 2013-02-17. ↑ cumulus. San Francisco, California: Wikimedia Foundation, Inc. February 8, 2013. Retrieved 2013-02-17. ↑ cloud. San Francisco, California: Wikimedia Foundation, Inc. February 13, 2013. Retrieved 2013-02-18. ↑ DOwenWilliams (21 December 2010). solar tracker. San Francisco, California: Wikimedia Foundation, Inc. Retrieved 2013-05-30. ↑ Craig F. Bohren. Atmospheric Optics (PDF). ↑ 30.0 30.1 Sue Lavoie (February 26, 2004). PIA05343: The Sun Sets on Mars. Pasadena, California USA: NASA/JPL. Retrieved 2013-04-01. ↑ 31.0 31.1 31.2 Carlson, R. W.; et al. (1999). "A Tenuous Carbon Dioxide Atmosphere on Jupiter's Moon Callisto" (PDF). Science 283 (5403): 820–821. doi:10.1126/science.283.5403.820. PMID 9933159. http://trs-new.jpl.nasa.gov/dspace/bitstream/2014/16785/1/99-0186.pdf. ↑ 32.0 32.1 Liang, M. C.; Lane, B. F.; Pappalardo, R. T.; et al. (2005). "Atmosphere of Callisto" (PDF). Journal of Geophysics Research 110 (E2): E02003. doi:10.1029/2004JE002322. http://yly-mac.gps.caltech.edu/ReprintsYLY/N164Liang_Callisto%2005/Liang_callisto_05.pdf. ↑ 33.0 33.1 Kliore, A. J.; Anabtawi, A; Herrera, R. G.; et al. (2002). "Ionosphere of Callisto from Galileo radio occultation observations". Journal of Geophysics Research 107 (A11): 1407. doi:10.1029/2002JA009365. ↑ Arvydas J. Kliore, D. P. Hinson, F. Michael Flasar, Andrew F. Nagy, Thomas E. Cravens 1997 (July). "The Ionosphere of Europa from Galileo Radio Occultations". Science 277 (5324): 355–8. doi:10.1126/science.277.5324.355. PMID 9219689. http://www.sciencemag.org/cgi/content/abstract/277/5324/355. Retrieved 2007-08-10. ↑ Galileo Spacecraft Finds Europa has Atmosphere. Project Galileo. NASA, Jet Propulsion Laboratory. July 1997. Retrieved 2007-08-10. ↑ William H. Smyth, Max L. Marconi 2006. "Europa's atmosphere, gas tori, and magnetospheric implications". Icarus 181 (2): 510. doi:10.1016/j.icarus.2005.10.019. ↑ 42.0 42.1 Phil Davis. Hubble Finds Ozone on Jupiter's Moon Ganymede. Washington, DC USA: NASA. Retrieved 2013-06-22. ↑ 43.0 43.1 Sue Lavoie (October 13, 1998). PIA01637: Io's Aurorae. Pasadena, California: NASA and the Jet Propulsion Laboratory, California Institute of Technology. Retrieved 2012-07-22. ↑ 44.0 44.1 Sue Lavoie (May 31, 2001). PIA03450: Io Color Eclipse Movie. Tucson, Arizona USA: NASA/JPL/University of Arizona. Retrieved 2013-05-30. ↑ Guillot, Tristan; et al. (2009). "Saturn's Exploration Beyond Cassini-Huygens". In Dougherty, Michele K.; Esposito, Larry W.; Krimigis, Stamatios M.,. Saturn from Cassini-Huygens. Springer Science+Business Media B.V. p. 745. arXiv:0912.2020. Bibcode:2009sfch.book..745G. doi:10.1007/978-1-4020-9217-6_23. ISBN 978-1-4020-9216-9. ↑ Courtin, R. et al. (1967). "The Composition of Saturn's Atmosphere at Temperate Northern Latitudes from Voyager IRIS spectra". Bulletin of the American Astronomical Society 15: 831. ↑ Cain, Fraser (January 22, 2009). Atmosphere of Saturn. Universe Today. Archived from the original on 2011-10-05. Retrieved 2011-07-20. ↑ Jim Wilson (March 23, 2008). Saturn's Blues. Pasadena, California USA: NASA/JPL. Retrieved 2013-03-27. ↑ 51.0 51.1 51.2 Sue Lavoie (May 2, 2005). PIA06236: Titan: Complex 'Anti-greenhouse'. Pasadena, California USA: NASA/JPL. Retrieved 2013-06-13. ↑ Robert Nemiroff & Jerry Bonnell (July 24, 2012). South Polar Vortex Discovered on Titan. Greenbelt, Maryland USA: ASD at NASA / GSFC & Michigan Tech. U. Retrieved 2013-06-13. ↑ 53.0 53.1 53.2 53.3 53.4 53.5 53.6 53.7 53.8 53.9 Jonathan I. Lunine. "The Atmospheres of Uranus and Neptune". Annual Review of Astronomy and Astrophysics 31: 217–63 1993. doi:10.1146/annurev.aa.31.090193.001245. ↑ 57.0 57.1 57.2 57.3 Tyler, J.L. ; Sweetnam, D.N. ; Anderson, J.D. ; Campbell, J. K.; Eshleman, V. R.; Hinson, D. P.; Levy, G. S.; Lindal, G. F. et al. (1986). "Voyger 2 Radio Science Observations of the Uranian System: Atmosphere, Rings, and Satellites". Science 233 (4759): 79–84. doi:10.1126/science.233.4759.79. PMID 17812893. ↑ 66.0 66.1 Sromovsky, L. A.; Fry, P. M.; Hammel, H. B.; Ahue, W. M.; de Pater, I.; Rages, K. A.; Showalter, M. R.; van Dam, M. A. (September 2009). "Uranus at equinox: Cloud morphology and dynamics". Icarus 203 (1): 265–286. Bibcode 2009Icar..203..265S. doi:10.1016/j.icarus.2009.04.015. ↑ 67.0 67.1 67.2 Hammel, H.B. ; Lockwood, G.W.. "Long-term atmospheric variability on Uranus and Neptune". Icarus 2007 186: 291–301. doi:10.1016/j.icarus.2006.08.027. ↑ Lockwood, G. W.; Jerzykiewicz, Mikołaj A. (February 2006). "Photometric variability of Uranus and Neptune, 1950–2004". Icarus 180 (2): 442–452. Bibcode 2006Icar..180..442L. doi:10.1016/j.icarus.2005.09.009. ↑ Emily Lakdawalla. No Longer Boring: 'Fireworks' and Other Surprises at Uranus Spotted Through Adaptive Optics. The Planetary Society. Archived from the original on May 25, 2006. Retrieved June 13, 2007. ↑ Hammel, H. B.; de Pater, I.; Gibbard, S. G.; Lockwood, G. W.; Rages, K. (May 2005). "New cloud activity on Uranus in 2004: First detection of a southern feature at 2.2 µm" (PDF). Icarus 175 (1): 284–288. Bibcode 2005Icar..175..284H. doi:10.1016/j.icarus.2004.11.016. ↑ 74.0 74.1 Young, Leslie A.; Bosh, Amanda S.; Buie, Marc; Elliot, J. L.; Wasserman, Lawrence H. (2001). et al. 2001Uranus.pdf "Uranus after Solstice: Results from the 1998 November 6 Occultation" (PDF). Icarus 153 (2): 236–247. doi:10.1006/icar.2001.6698. http://www.boulder.swri.edu/~layoung/eprint/ur149/Young et al. 2001Uranus.pdf. ↑ Crisp, D.; Hammel, H. B. (14 June 1995). Hubble Space Telescope Observations of Neptune. Hubble News Center. Retrieved 22 April 2007. ↑ Orton, G. S., Encrenaz T., Leyrat C., Puetter, R. and Friedson, A. J.. "Evidence for methane escape and strong seasonal and dynamical perturbations of Neptune's atmospheric temperatures". Astronomy and Astrophysics 473: L5–L8. doi:10.1051/0004-6361:20078277 2007. ↑ F. Spite and M. Spite (November 1982). "Abundance of lithium in unevolved halo stars and old disk stars - Interpretation and consequences". Astronomy and Astrophysics 115 (2): 357-66. http://adsabs.harvard.edu/abs/1982A%26A...115..357S. Retrieved 2013-05-31. ↑ John H. E. Clark (March 1999). "Gravity Waves Driven by Diurnal Fluctuations in Mesoscale Heating". Journal of the Atmospheric Sciences 56 (5): 769-83. doi:10.1175/1520-0469(1999)056<0769:GWDBDF>2.0.CO;2. http://journals.ametsoc.org/doi/abs/10.1175/1520-0469(1999)056%3C0769%3AGWDBDF%3E2.0.CO%3B2. Retrieved 2013-02-22. ↑ temperature. San Francisco, California: Wikimedia Foundation, Inc. January 9, 2013. Retrieved 2013-02-21. ↑ Sandman30s (22 July 2005). aerology. San Francisco, California: Wikimedia Foundation, Inc. Retrieved 2018-02-23. ↑ aeronomy. San Francisco, California: Wikimedia Foundation, Inc. March 26, 2012. Retrieved 2013-02-22. ↑ Sydney Chapman. The Thermosphere - the Earth's Outermost Atmosphere. Physics of the Upper Atmosphere 1960. Academic Press. p. 4. ISBN 978-0125820509. ↑ Climate Prediction Center Climate Glossary. Retrieved November 23, 2006. ↑ Joel7687 (17 September 2005). mesosphere. San Francisco, California: Wikimedia Foundation, Inc. Retrieved 2013-02-21. ↑ Jonathan Webley (18 January 2007). mesopause. San Francisco, California: Wikimedia Foundation, Inc. Retrieved 2013-02-21. ↑ Bakerkb1 (6 January 2011). mesopause. San Francisco, California: Wikimedia Foundation, Inc. Retrieved 2013-02-21. ↑ Joel7687 (17 September 2006). thermosphere. San Francisco, California: Wikimedia Foundation, Inc. Retrieved 2013-02-21. ↑ CORNELIUSSEON (11 June 2006). ionosphere. San Francisco, California: Wikimedia Foundation, Inc. Retrieved 2012-09-20. ↑ RJFJR (15 November 2008). ionosphere. San Francisco, California: Wikimedia Foundation, Inc. Retrieved 2012-09-20. ↑ Nola Taylor Redd (September 4, 2012). Meteoroids Change Atmospheres of Earth, Mars, Venus. Space.com. Retrieved 2012-09-05. ↑ SemperBlotto (22 November 2008). exosphere. San Francisco, California: Wikimedia Foundation, Inc. Retrieved 2013-02-21. ↑ Kwamikagami (5 March 2012). exosphere. San Francisco, California: Wikimedia Foundation, Inc. Retrieved 2013-02-21. ↑ meteorology. San Francisco, California: Wikimedia Foundation, Inc. January 22, 2013. Retrieved 2013-02-15. ↑ astrometeorology. San Francisco, California: Wikimedia Foundation, Inc. February 12, 2011. Retrieved 2013-02-15. ↑ cyclone. San Francisco, California: Wikimedia Foundation, Inc. February 8, 2013. Retrieved 2013-02-22. This page was last edited on 29 March 2019, at 03:50.